Was my Mom's last car. She was already getting too old to drive and with much hesitation she gave it to me. I had to replace the radiator immediately. My dear Uncle Eugene lent me $50 before I left Baltimore. I paid him back like 10-15 years later. Made it down to Titusville, near the Space Center, before the engine block cracked. Nostalgically, because it was a Buick, it reminded me of her first car, a used 1948 Roadmaster. 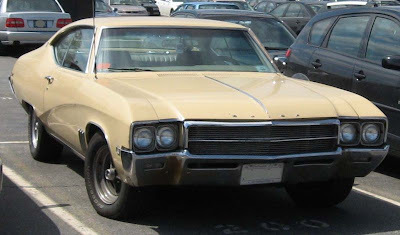 This '69 Skylark was Buick's intermediate size car, not a full size boat.